The 2008 Harley Davidson Rocker C for Sale has a beautiful Blue Pearl paint color and the motorcycle is in nearly brand new condition, with extremely low mileage of only 1080 miles on it. The Rocker is loaded with chrome and is fuel injected with a six (6) speed transmission. It is very quick (FAST!) and rides well. 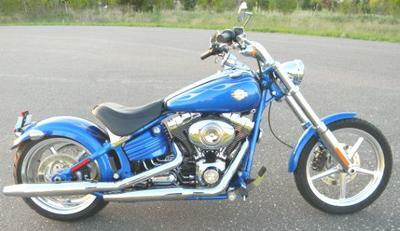 Because it is a Harley softail with the look of a hardtail, it will give you a very smooth ride. This bike has been exclusively ridden only by me, and I am an experienced rider. If you have experience with a similar motorcycle you are welcome to write a review or voice your opinions using the space below that has been provided by Strike Lightning Used Motorcycles for Sale (and PLEASE do not neglect to include your contact information in your email or to provide a phone number or email address!) so that I can respond with answers to your questions or after consideration of your best offer as quickly as possible. In my opinion there is nothing more beautiful Rocker C for sale in Wisconsin, on Craigslist or in an Ebay auction so hurry and make an offer before it gets away from you! Strike Lightning would also encourage bikers to submit a review of the 2008 Harley Davidson Rocker C for Sale to make the biker community aware of any problems that are commonly associated with the 2008 model or to highlight its positive features and help potential buyers make informed decisions. Please call me, Jeff, with questions or to make an appointment at 651-775-776two and don't forget to mention that you found this ad on Strike Lightning's Motorcycle Classifieds gogocycles.com.